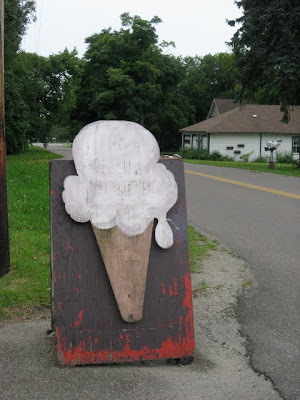 You get a creemee, which is maple syrup in soft ice cream, at the Grinder Place over the bridge from North Hero on an isle called La Motte, steps from the shrine of St. Anne, which is perched above the spot where Champlain landed and named his lake. Down in North Hero, a faded shuffleboard court overlooks the empty rafts sitting in the river, and far out a yellow seaplane idles. The season is ending and there are boats that have already been hoisted up on racks amidst the yard sales. There is another creemee place, Allenholm Farm, but that’s further down, off Vermont #2 in the town of South Hero, where you can also get something like a grinder at a place called Sebs. The skies are gray and bicyclists brave the rain, but there is nothing that will spare eternal summer, whose log is written (like the deeds in the Book of Life that Jews ante up for the impending Yom Kippur) on the weathered houses lining the route to the ferry going back and forth from the Champlain Islands to Plattsburg, New York. Plattsburg is the final stop on I-87, which passes Saranac, Scroon Lake, and the ominous Dannemora prison at Clinton, marked by a simple sign whose implicit admonition goes unheeded by the ubiquitous motorcyclists, with their superhuman heft, Gestapo helmets and horsepower You descend from the Adirondack mountains to Lake Champlain to find something timeless and perennial, a legendary dessert to reward the effort of your voyage.